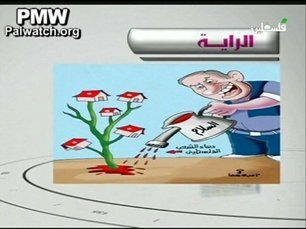 Israeli PM Netanyahu is shown watering a plant with a water can labeled "peace," but the can is filled with Palestinian blood. The plant being watered with blood is sprouting houses, representing the settlements. Text below: "The blood of the Palestinian people"